New Caledonia is one of the world's most interesting and exciting areas for botanists. This French Overseas Territory is located in the southwest Pacific about 1,200 km east of Queensland, Australia and approximately 1,500 km north-northeast of New Zealand, and situated between approximately 19°30' and 22°40' S latitude. 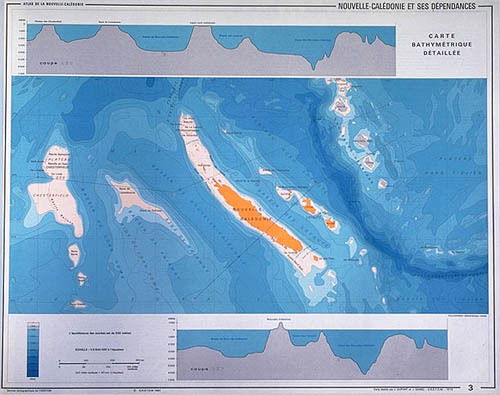 Maps showing New Caledonia in the SW Pacific (source: Atlas de la Nouvelle-Calédonie. ORSTOM, Paris). the islands flora is exceptionally rich for an area its size. the flora contains numerous relict representatives of the late Cretaceous - early Tertiary Gondwanan flora of Australasia, including members of several primitive flowering plant families and a particularly rich gymnosperm flora. These groups have survived and radiated on New Caledonia, but are now greatly reduced in numbers or have entirely disappeared from other parts of the region. Compared with most tropical areas, New Caledonia has a flora that is very well studied and documented. The origin, evolution, and biogeographic history of New Caledonia's native plants and vegetation have been the subject of many publications during the last 125 years (Balansa, 1873; Brousemiche, 1884; Schlechter, 1905; Sarasin, 1917; Guillaumin, 1921, 1924, 1928, 1934, 1948, 1953a, b, 1954, 1964; Däniker, 1929, 1931, 1939; Good, 1955; Baumann-Bodenheim, 1956, 1988, 1989a, b, c, 1990; Virot, 1956; Balgooy 1960, 1971; Thorne, 1963, 1965, 1969; Raven and Axelrod, 1972, 1974; Jaffré, 1974, 1980, 1993, 1995; Holloway, 1979; Raven, 1980; Morat et al., 1981, 1984, 1986; Jaffré et al., 1987, 1993; Schmid, 1987; Lowry, 1991; Jaffré and Veillon, 1991, 1995; Morat, 1993; Bouchet et al., 1995). New Caledonia has also received much attention from plant collectors, starting with the Forsters, who accompanied Capt. Cook on the first European expedition to visit the island, and continuing throughout much of the 20th century (cf. H. S. MacKee, 1964; M. E. MacKee, 1972; Morat, 1993, 1995). 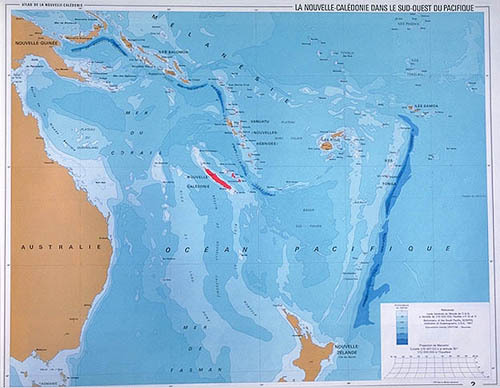 Most of the intensive botanical exploration of New Caledonia has been conducted during the last four decades. Hugh McKee collected about 45,000 numbers between the 1960s and his death in 1995. Other important modern field botanists include Jean-Marie Veillon, Tanguy Jaffré and Philippe Morat of ORSTOM in Nouméa, and Gordon McPherson of the Missouri Botanical Garden. 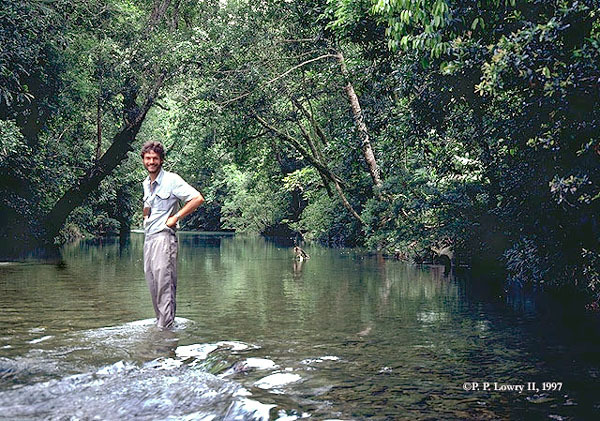 The author crossing the Mindoi River, northwest of Houaïlou. 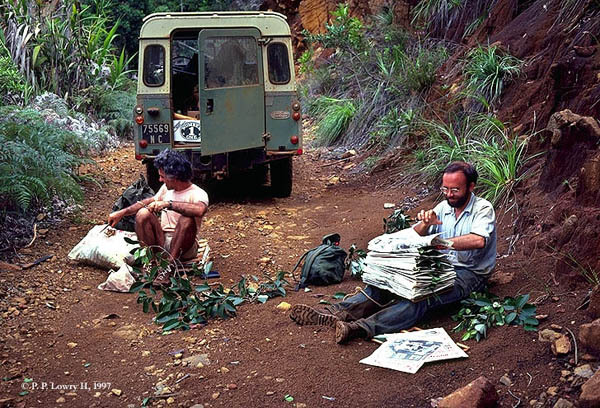 To date, about 70-75,000 herbarium collections have been made in New Caledonia, representing between 200,000 and 250,000 individual specimens. This material is used for the Flore de la Nouvelle-Calédonie et Dépendences published by the Muséum National dHistoire Naturelle in Paris. To date the Flore covers 45 families and 1,281 species, or almost 27% of the approximately 4,780 vascular plant species present in the territory, of which about 1,400 are introduced or cultivated (MacKee, 1994) and 3,380 are regarded as native (Morat, 1993). In all, nearly 70% of the flora is covered by modern taxonomic treatments.